Monte’s is located at 220 N Broadway and has been a fixture in downtown Fargo since it opened its doors in 2002. It will be closing its doors January first and an extensive remodel will be underway. Fear not dear patrons, Monte’s doors will reopen after a few months. Not only will the interior experience a revamp but the menu will as well. In fact Monte’s plans on having a big New Year’s she-bang to send Monte’s as we knew it off in style and usher in 2016 with new surroundings. 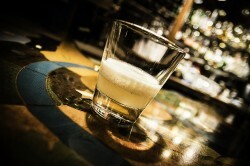 The Guavalada contains guava juice, pineapple juice, coconut milk, Malibu, and Bacardi. The idea came to Eversman as he was bartending at a party in which the patrons were served Caribbean jerk style ribs and wanted to maintain the Caribbean flavor. The original drink was a mojito inspired guava drink. The Guavalada is a spinoff of that idea, but it is essentially a guava pinacolada. Brace yourself bacon lovers, “The Spicy Maple Bacon” starts out with a maple, crispy housemade perfectly-crumbled-bacon rim, add Jack Daniels, Sriracha, Richora cinnamon liqueur,a touch of whipped cream, a dusting of cinnamon, and a cinnamon stick garnish. This deliciously sweet, salty, mildly spiced cocktail was inspired by the maple bacon donut from Sandy’s donuts--another local favorite and relative newcomer to downtown Fargo. Rustica is located at 315 Main Ave. in Moorhead, and is divided into two sections--the tavern and the eatery. Rustica is upscale yet casual, the fare is American with European influences. The dining area may require a reservation for dinner but still has seating at the bar. The exposed brick walls and rustic wood finish give Rustica an understated elegant ruggedness. “The Brandied Apple” contains Clear Creek apple infused brandy (which is aged in French oak casks for eight years), B&B (Benedictine and Brandy), Grand Marnier, a pinch of ground cinnamon, organic apple spice, and Bitterman’s tiki bitters. The ingredients are then stirred to prevent dilution. 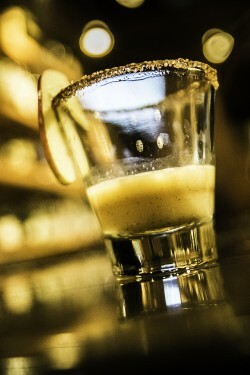 The glass is then rimmed with Grand Marnier and a combination of cinnamon and sugar in the raw, housemade ice cream is added and then garnished with a slice of apple. Berglund wanted to create a seasonal cocktail--once he got his hands on a good brandy he build the cocktail from there. The “Savory Spaniard” is based off of a heavy Spanish influence, which Berglund cites as an homage to Rustica’s Italian and Spanish influences. The cocktail starts with hickory chips and a pinch of tobacco from a cu avana (a Nicaraguan cigar) which is then put through a smoker and the ice is smoked. 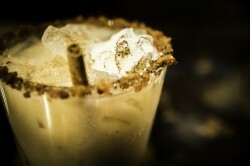 This phenomena is referred to as “molecular mixology”. 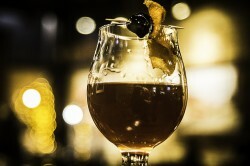 It includes mascerated citrus, luxardo maraschino cherries, high west double rye, liquor 3 (chosen for its vanilla and citrus flavors), Vina 25 (which is a sherry port fortified in brandy barrels), burlesque bitters are added and then the cocktail is stirred. The glass is then given a campari wash with a soda charge to round out the flavors. The cocktail is sifted for a nice even texture and served in a snifter glass and is served neat (without ice). The garnish is an orange peel candied with a Maine simple syrup (donated by Zandbroz Variety). Hennessy’s Irish Pub is located at 4323 45th St. S in Fargo. They offer daily drink specials, happy hours and have a pub menu that includes burgers, sandwiches, wraps, and traditional items such as shepard’s pie, fish and chips, as well as bangers and mash. They also offer a list of Irish whiskeys and scotch. Though it is new to Fargo, Hennessy’s has an old world feel. Our bartender Eric Krogh, explained to us that the bar was actually shipped to Fargo from The Emerald Isle. The Irish Pub company is a company based out of Ireland that constructs and ships Irish style pubs. Not only did the team involve nine finishing carpenters, but an artist came along as well to complete a mural based off of pre-Euro Irish currency. 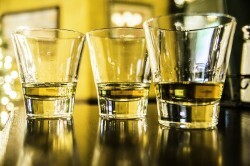 The shot...or rather shots, were three half ounce pours of Irish whiskey. Walking into Hennessy’s we knew they were serious about Irish whiskey, but we weren’t sure how serious they were until the moment of truth arrived. The first shot was a half ounce of Jameson Caskmates, which is finished in a Guinness barrel and is a relatively new, small batch whiskey. The second stop on our tour was Red Breast 12 year, which is one of the few Irish whiskeys that has an age statement. The third and last stop was the Jameson black-barrel, which tends to be smokier than the Jameson we all know and love. 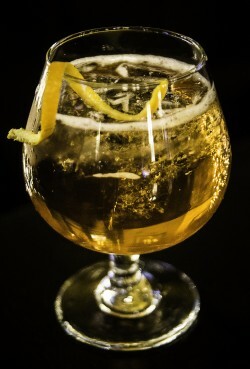 The Cider and Black includes Jameson black-barrel, Magner’s Irish cider, cardamom bitters, cinnamon simple syrup, and an orange twist. Krogh wanted to opt for a seasonal cocktail while holding true to the Irish theme.